Saint Francis of Assisi is one of the most beloved and inspirational figures in the history of Christianity. The stunning illustrations of award-winning author, Demi, bring to life the story of this son of a rich merchant, who abandoned all his worldly goods in order to follow the teachings of Jesus Christ. 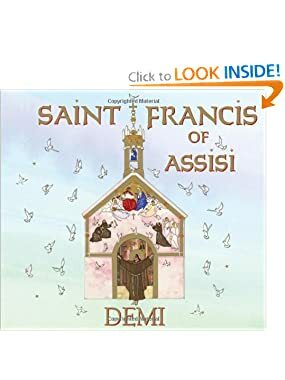 Inspired by the remarkable example of his holiness, Saint Francis is venerated by millions of Christians around the world, no matter their denomination. This is a beautiful book and I'm going to put in on my nine year old daughter's Kindle Fire and see what she thinks of it. However, from my perspective it spends a lot of time focusing on the miraculous in St. Francis' life and little focusing on his actual deeds and teaching. Still, most of what I just read on Wikipedia about St. Francis made it into the book. There are large drawings on each page, which are done in such a way as to appear to be framed artwork. While there is not a tremendous amount of writing on any page, the vocabulary is above that generally used in books for young children. At 60 pages I believe it is too long to be read aloud at a single sitting, however there are no chapter breaks or other logical stopping points. Therefore I would recommend it for kids in the 9-12 age group--old enough to read for themselves and to have the necessary vocabulary. Interesting. I hadn't heard of this book. We have Demi's books on Mother Teresa and Muhammad but these aren't bedtime books, you know.